MANELI is the new collection of the popular fashion brand, Sania Maskatia. This fashion house has released the leading and most tremendous dress collection for the spring season. 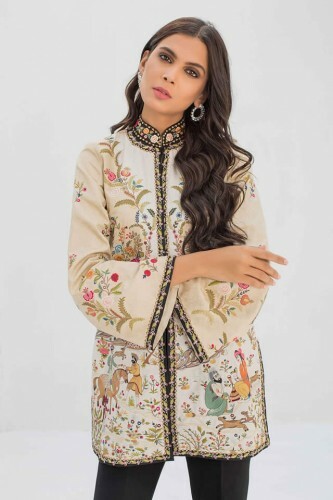 MANELI Spring Collection 2019 by Sania Maskatiya. This fashion collection has the features of signature handcrafted pieces, which are excellent for blooming spring season. This collection has 17 distinct blossoming embellishments and digital printed vignettes. Some of the pieces are prepared with blowy, breezy and ruffled dupattas and you can find bohemian and floral patterned peshwas shows the spring collection. The latest and unique dress collection captures the ephemeral feelings of summer romance. 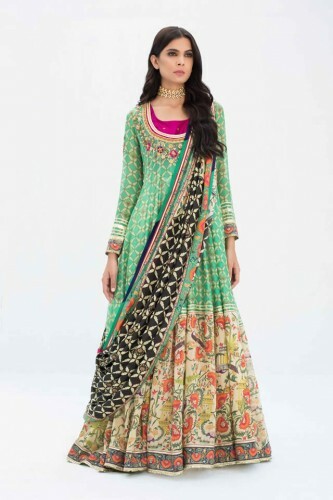 You can find the collection colorful with luminous papaya, gold jacquard, cherry red, emerald green and sweet ladylike pastel colors in the dresses, which are displayed during this collection. The images of the dresses of this fashion brand are provided here and you can find this collection great and wonderful for the women for coming spring and summer season.